Trip Description : This is one of the most popular tours, and it gives guests a rich insight into Buddhism, architecture and the hustle and bustle of Bangkok. Three of the capital’s most stunning temples are visited including the boat trip along the Chao Phya River and canal. Visit Wat Pho or Temple of the Reclining Buddha, founded in the 16th century, the oldest and biggest temple with the largest number of pagodas (95 in all) in the city. Wat Pho was the first open university of Thailand which offered courses in several branches of knowledge like literature, astrology, medicine and massage. It's well known for its huge Reclining Buddha, 46 m. long and 15 m. high. 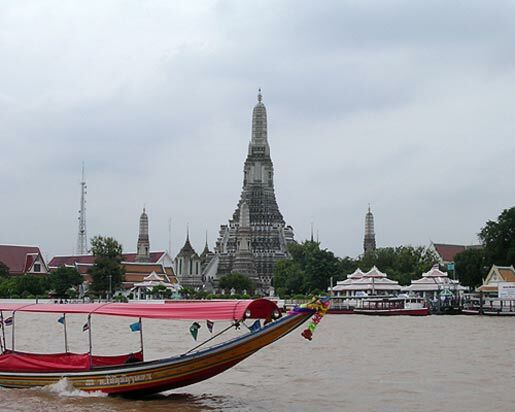 Continue the tour with a comfortable long-tail motor boat trip along the Chao Phraya River and canals in Thonburi area. You will be treated to a spectacular and colorful scenery of Thai life along the river banks. The Bangkok people still depend on the waterways to transport their merchandise. Enroute you can see many magnificent temples and architectural buildings, including Grand Palace, Wat Arun or The Temple of Dawn, the Royal Thai Navy Dockyard, the Thai Maritime Navigation Company, the Old Customs House and Royal Barges Museum. City-sightseeing tour along Ratchadumnoen Rd. (The Royal's Way). En route you can see many magnificent temples and architectural buildings, including the National MuseumDemocracy Monument Golden Mountain, Thai Boxing Stadium Anantasamakhom Palace Parliament House Dusit Zoo and Chitlada Palace King's Residence. 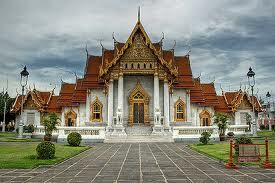 Then Visit Wat Benchamabopit or Marble Temple, one of the most modern works of Thai religious architecture. Graceful and tranquil, it is famous for its main chapel built in white Carara Italian marble to house a replica of Thailand's most beautiful Buddha image, Phra Phutthachinarat.